Fri., Sept. 28, 2018, 6:59 p.m.
Pac-12 Commissioner Larry Scott is clarifying comments he made about the controversial non-call for targeting late in last Friday’s game between Washington State and USC. 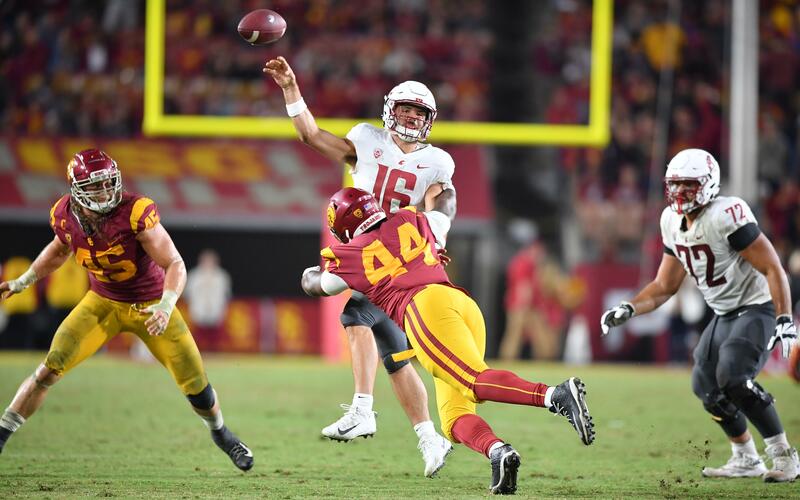 USC’s Porter Gustin made helmet-to-helmet contact with Cougars quarterback Gardner Minshew at a critical juncture of the game. The Trojans won, 39-36. Speaking at the halftime of Oregon’s game against Stanford on Saturday, Scott said the play had been looked at by not just the officials at the Coliseum, but also the league’s “command center” in San Francisco. Targeting was not called. “In any given game there are a lot of close calls And this was a very, very close one, no question about it,” Scott said. He sought to clarify the comments on Friday night before UCLA’s game at Colorado, acknowledging the media attention on his statements. “What I sought to do was to explain that not only was that call was reviewed, every call is reviewed, by replay in the stadium, replay at the command center back in San Francisco. And just because a play isn’t stopped, and it’s not buzzed down, doesn’t mean that it wasn’t reviewed. And I commented that I checked to make sure that process had actually taken place, and it had. The Pac-12 does an internal review of any controversial call on Mondays with the head of officiating, the head of replay and other league representatives, Scott said. They also communicate with the schools. But those reviews and the conclusions are not made public as a policy. At his media availability Monday, Washington State coach Mike Leach was asked about the non-call. “I’d be happy to comment on it if I were allowed to, but I’m not allowed to. But if I were allowed to I’d be happy to,” he said, suggesting questions be directed to the Pac-12 offices. “Anything we do in this conference, player safety should be the forefront of our concerns,” Leach said. AP freelancer Michael Kelly in Boulder, Colorado, contributed to this report. Published: Sept. 28, 2018, 6:59 p.m.